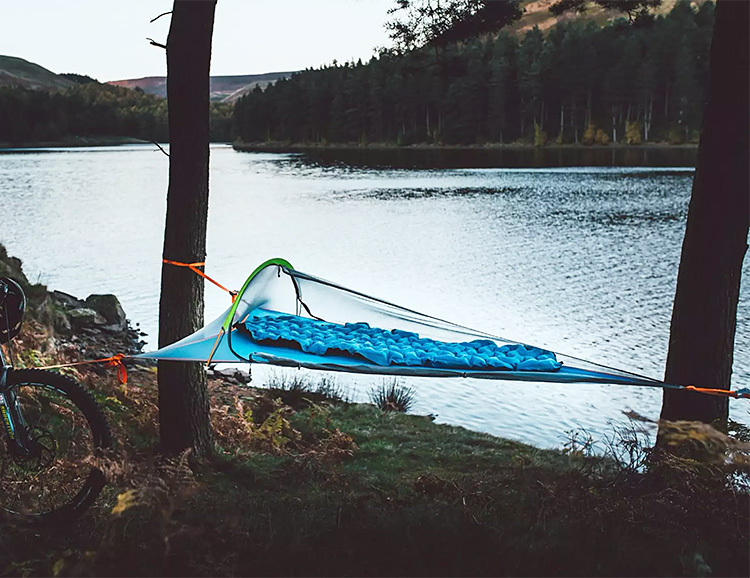 U.K.-based outdoor innovators Tentsile have really outdone themselves with the introduction of the Universe tent, an outdoor shelter that works in pretty much any environment—as a normal ground tent, a suspended aerial tree tent, and as a floating, raft-style tent allowing you to sleep on the water. It sleeps up to 5 adults. Take up in the trees or out onto a pond, lake, or lagoon. Just be careful when you get up to take a late-night wizz. 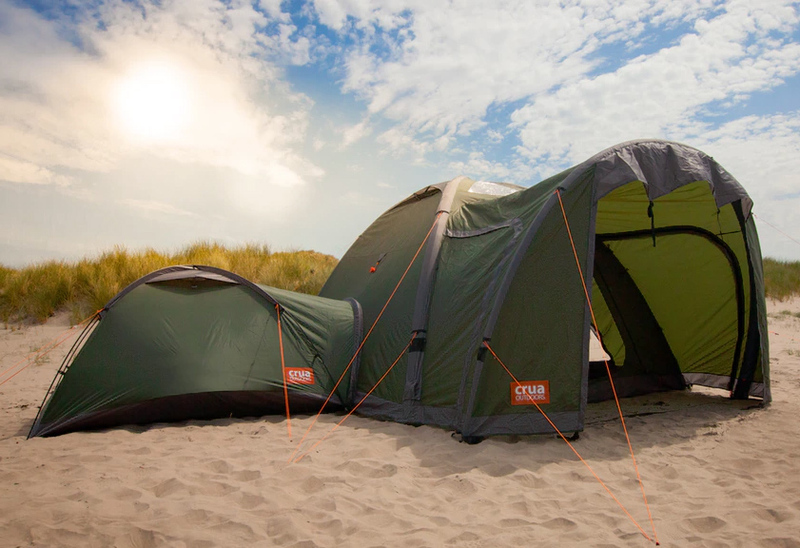 The Crua Clan Modular tent system gives you lots of options. It consists of three tents that can be linked together or used separately for car camping, backpacking or adding an annex to the main tent. 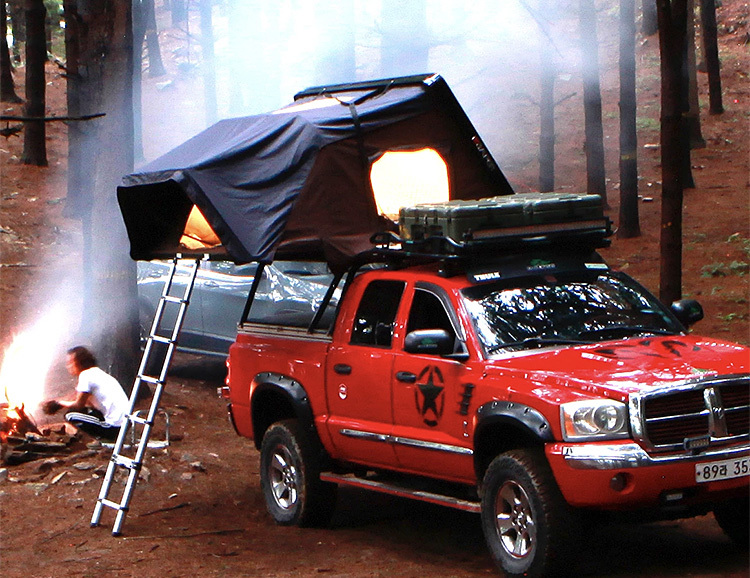 The large Core tent features an air-frame and can also attach to your vehicle. The Cocoon tent features insulation for winter & cold-weather camping, and the Duo is a 2-person you can carry in your pack. If you’re heading out for a night in the wilderness, the Austrian-designed Flying Tent is a super versatile outdoor shelter. 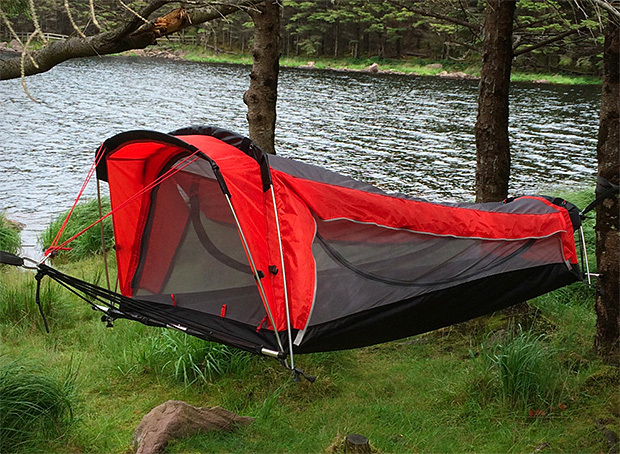 It’s the world’s first all-in-one floating tent, bivy tent, hammock & rain poncho. As a tent it sets up in 7 seconds & offers a rain resistant fly that can be removed for stargazing through mosquito netting. Zip off the upper section & you’ve got a poncho. Weight: a very packable 2.6 lbs. The Cinch! tent pops up automatically, effectively eliminating set-up time. Available in sizes for 2, 3, & 4 people the tent is made of double-walled 4000HH fabric to prevent condensation. 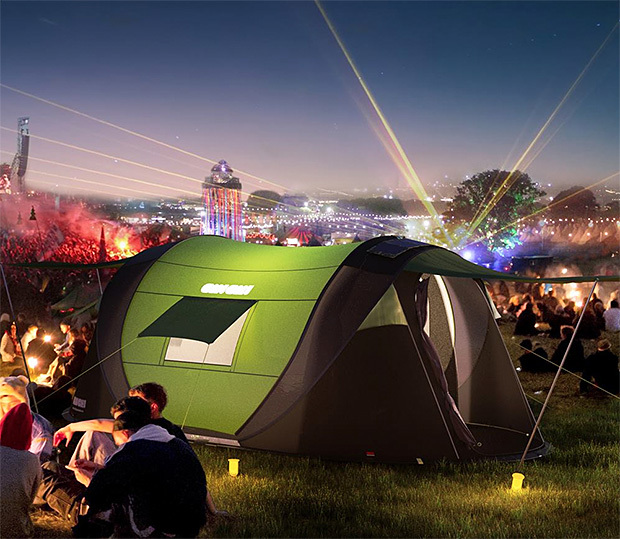 The dual-entry tent design features LED lanterns for illumination as well as an optional rooftop solar panel with a 13K mAh power bank. 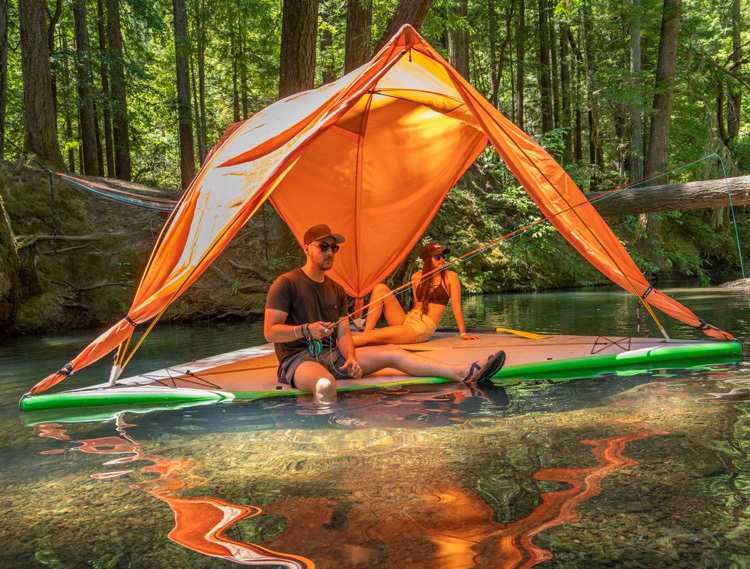 The new UNA tent from Tentsile is the latest addition to their growing line of tree tents. The ISPO Award-winning UNA is a single-person, three-season suspendible tent. It attaches to the trees at its 3 corners and features a removable rainfly as well as no-see-um mesh for gazing up at the stars. 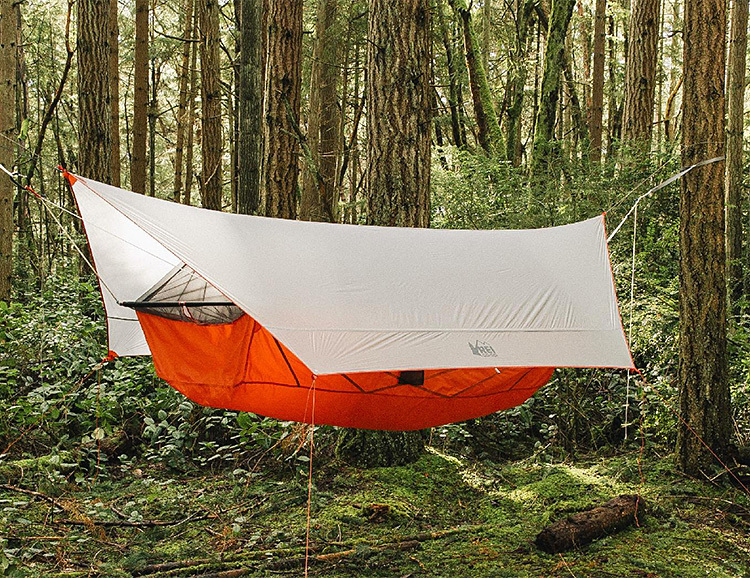 At 6.2 pounds, it is the lightest tree tent on the market. Available March 2018. When you have the luxury of choosing comfort over lightweight portability, a swag tent is what you want—it’s all about the built-in mattress pad. In the 1-man swag tent from Kodiak Canvas, the pad is a cushy 2-inches thick. 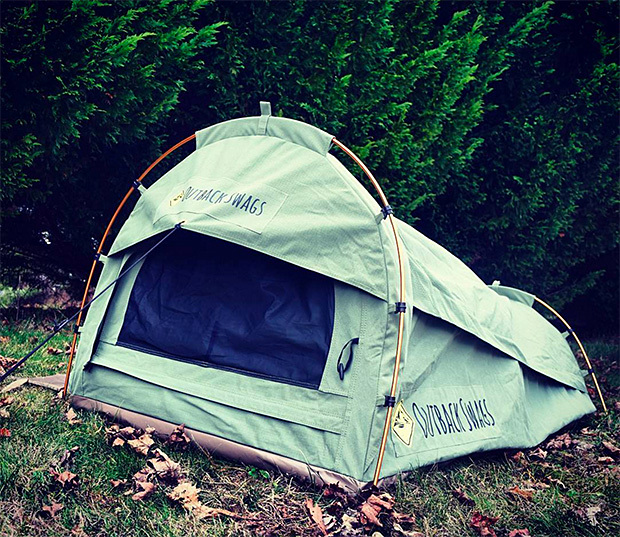 The tent itself is made of Hydra-Shield 100% cotton duck canvas and it’s a roomy 6’8” long by nearly 3-feet wide. When it’s time to break camp & move on, it all rolls up & stores in a duffle bag. 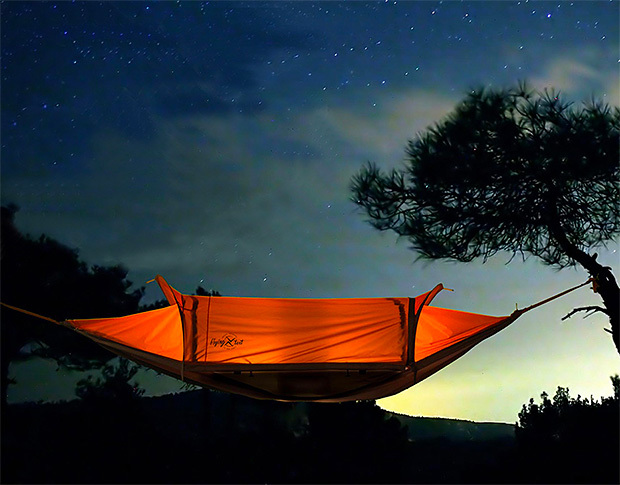 You can decide whether you prefer to use Crua Hybrid as a tent or a hammock, either way, you’ll get a sweet siesta. The design features a built-in insulated air mattress and a detachable sleeping bag plus it can link up with other Crua Hybrid tents so you can double-up or create your own tent village. As a hammock it holds up to 285 pounds yet the whole system—tent/hammock, air mattress & sleeping bag—weighs just 6.95 pounds. A funded Kickstarter. 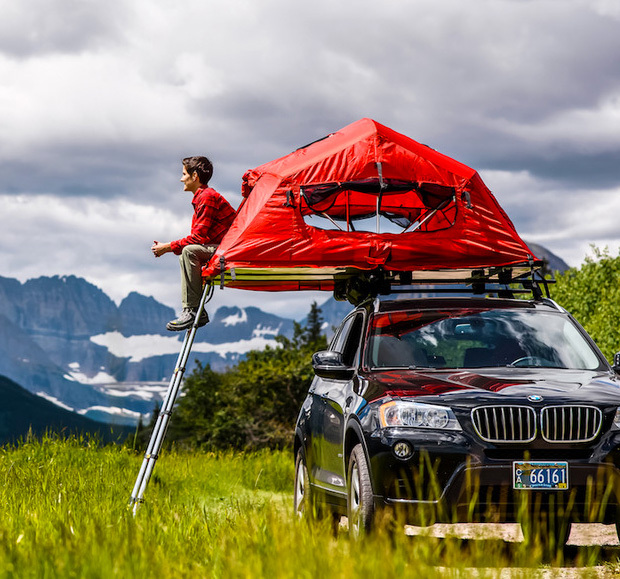 Two years after funding the most successful rooftop tent Kickstarter campaign ever for the Skycamp, iKamper is back with another soft-sided RTT called the X-Cover. The coverless design of this new model eliminates the need for a heavy PVC cover and the inverted platform creates the perfect base for mounting a roof rack, allowing you to haul toys on top of your tent. Inside the weatherproof canvas tent, there’s a king-size mattress & 5 large windows. 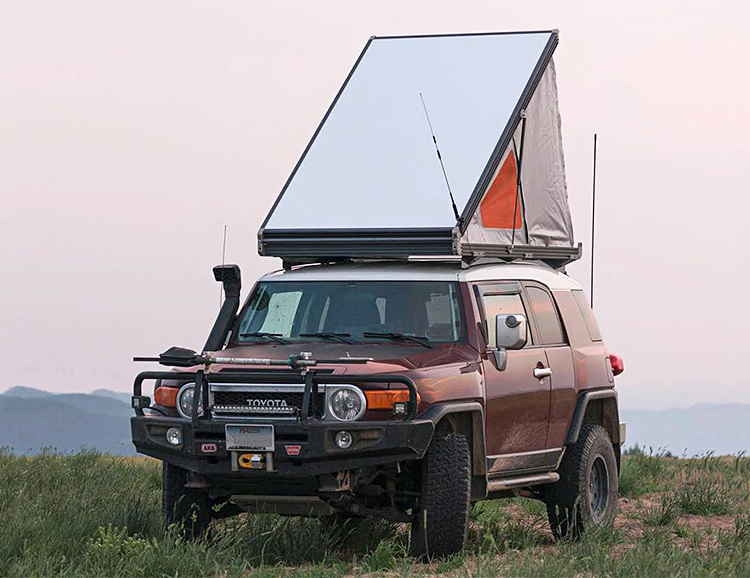 If you want to rig up your adventure-mobile with a rooftop tent, options are pretty limited. Most tents are heavy—built for extended African safaris. Yakima is about to change that. 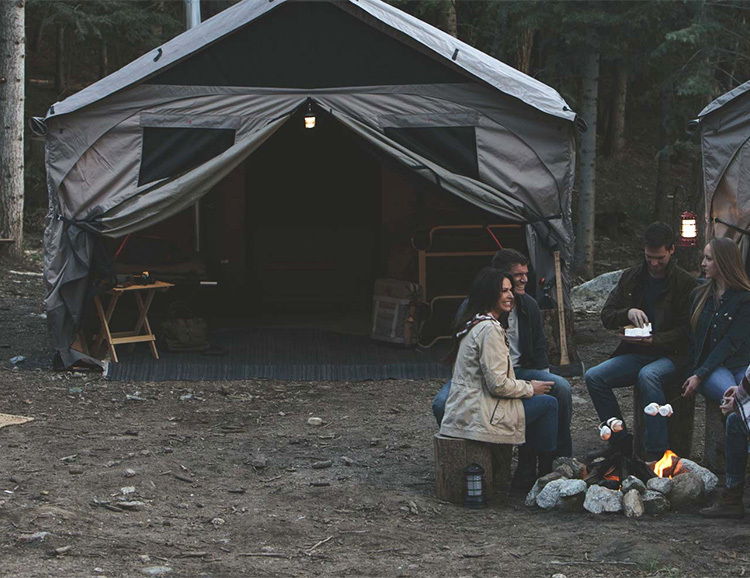 They’ve developed two lighter, smaller, rooftop tent models with modern designs & lightweight, breathable nylon construction. Available in early 2017. 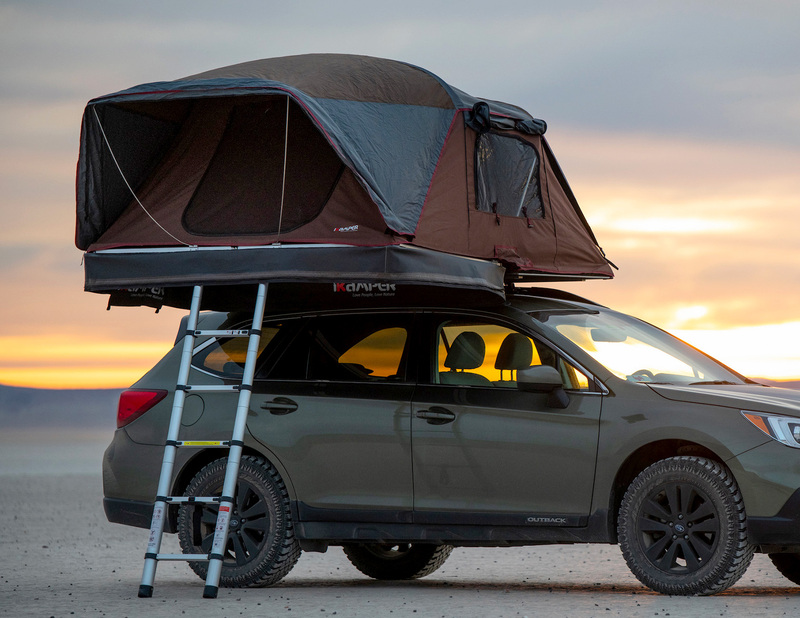 Lightweight, thin, and packed with user-friendly features, the GoFast Campers Platform is a new rooftop tent that will take your overland adventures to the next level. And not only is it the thinnest RTT on the market, which will save you fuel and reduce clearance height, it is 100% American made using all domestic components and parts. The tent canopy is made of waterproof fabric using welded construction with large mesh windows for unrestricted views. The mattress is 2-inch thick multi-density foam, and the mounting system work with standard racks. If you’ve suffered the effects of the sunrise sauna in your tent, check this out. The Siesta2 from Outback Logic is a compact all-season (including festival season) tent that blocks heat and light, allowing you to sleep comfortably even under blazing sun without sacrificing protection from the cold. The double-walled design is breathable and its heat & light blocking fly is waterproof. A funded Kickstarter. Technically speaking this is a tent, though it’s more like a soft-sided cabin. Built tough enough to handle 1000 pounds of snow load and 90 MPH winds, the 180 sq. ft. Lodge Tent can accommodate up to 12 people and features windows & doors front & back, all with screens. There’s also a built-in stovepipe port to let the smoke out while keeping the heat in. SlingFin is a new tent brand founded by a group of outdoor industry vets who’ve been focused on making tents worthy of Everest expeditions but they just launched a new line of ultralight tents aimed at backpackers. 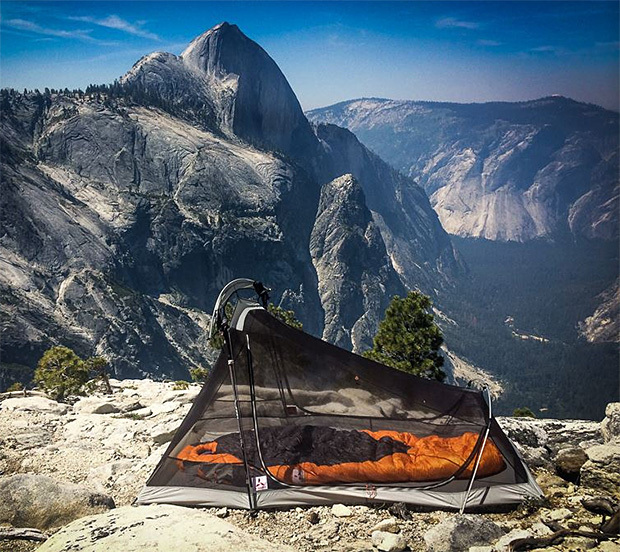 The 2Lite is a 2-person, 3-season tent that weighs just 2 lbs, 14.1oz. & features nearly vertical walls that make its 28-square foot floor feel even bigger. 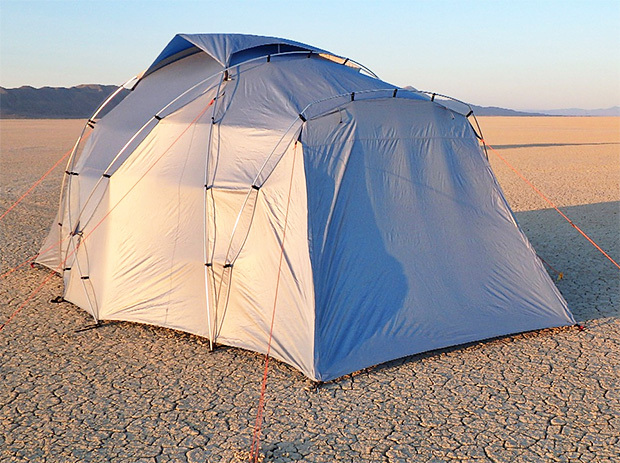 For festivals like Burning Man and Coachella where your chances of literally melting from the heat are pretty decent, the 6-person No Bake Tent could be a lifesaver. It’s a got a unique design that keeps you from roasting alive when the sun pops up and starts baking the mesa. 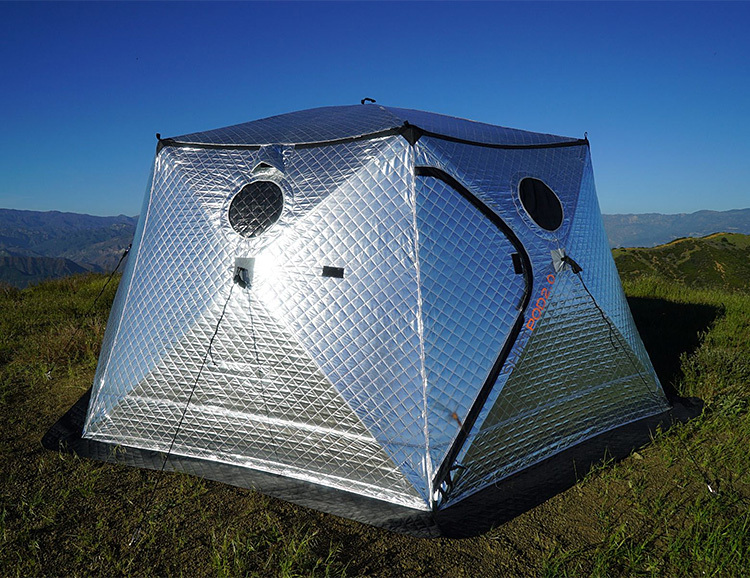 The outer layer of the tent reflects and blocks 90% of infrared & visible light rays, so it stays warm and dark inside. It is 6’6” tall and offers a long list of windproof, dustproof, and custom comfort features. 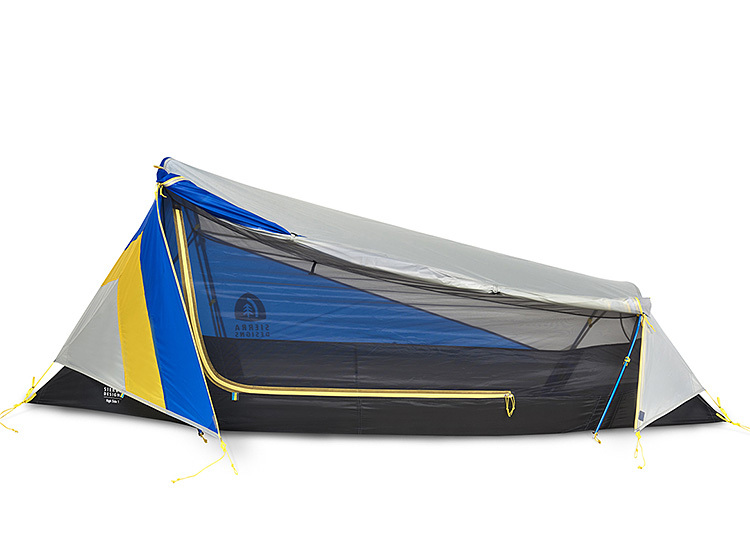 Combining the comfort and versatility of a hammock with the bugbite-reducing and weatherproofing features of a tent, REI’s Quarter Dome Air is a 3-season hanging 1-person tent that gives you the best of both with the option to just run it as a hammock anytime. With a tension based interior that needs no center pole, it offers a rainfly with plenty of overhead storage yet it weighs just 3.2 pounds. The Skycamp rooftop tent gives you a comfy, windproof & waterproof shelter with a king-size bed interior that provides enough space for up to 4 adults & 2 kids. A universal mounting system means it will work on most crossbar rack systems & its clamshell design makes for effortless set-up. There’s also a rooftop window for stargazing. Another funded Kickstarter. 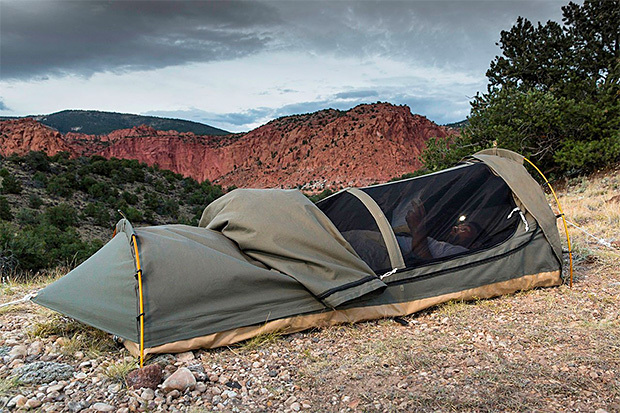 The Shiftpod2 Tent reflects heat and keeps out light, so you can sleep-in and stay cool no matter where you camp. Like out on the Mesa at Burning Man or under the blazing Coachella sun. The design utilizes a seven layer super composite fabric with synthetic down thermal insulation and highly reflective UV layers. It has two doors with bug screens, six windows with bug screens, and two vents with screens, sleeps 6 people, and sets up in under one minute. Made of heavy duty, waterproof 400GSM ripstop canvas and featuring a 2-inch thick built-in foam mattress, the Pioneer Swag Tent has room for 2 and a mesh ceiling for stargazing. A simple, 3-pole design makes set-up quick and easy. 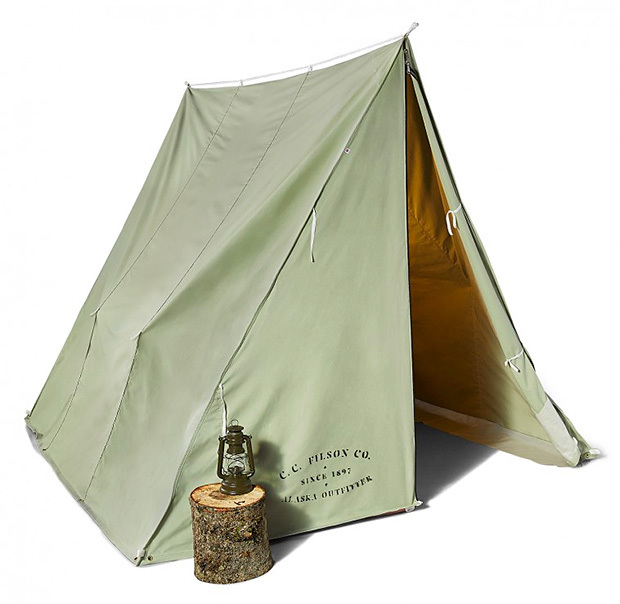 Classic styling and materials give Filson’s Wedge Tent that vintage vibe. It’s made of heavy-duty 10 oz. marine finish Army duck canvas to keep out wind & weather. It’s a floor-less design that can be set-up between trees or with the included sheer poles. Center height: 7-feet tall. 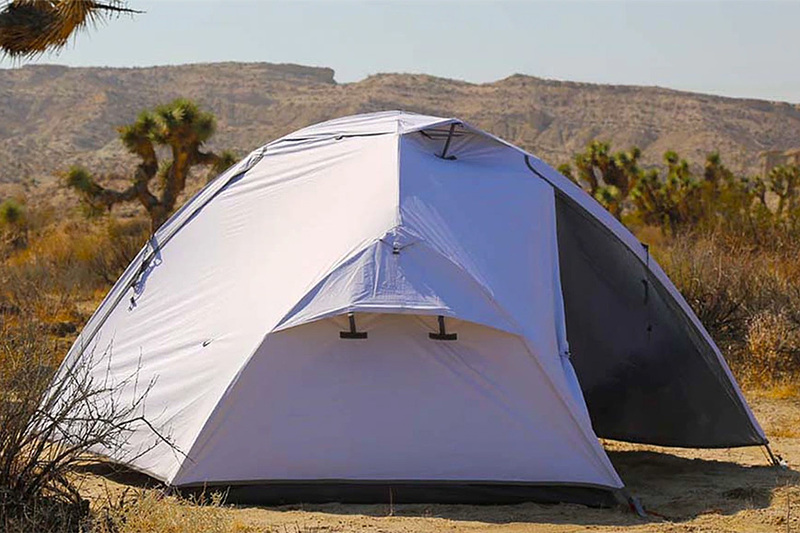 Voted a Top 12 tent of 2018 by Backpacker Magazine, Sierra Design’s High Side 1 features pre-bent pole sections that create a “high side” over the door to maximize livable space while minimizing weight, which is just over 2 pounds. All packed into its compact stuff sack, it will take up minimal space in your pack; perfect for the solo adventurer trying to keep things light & lean.